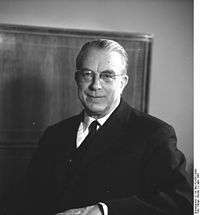 Hans Josef Maria Globke (10 September 1898 – 13 February 1973) was a German lawyer, high-ranking civil servant and politician who served as Under-Secretary of State and Chief of Staff of the German Chancellery in West Germany from 28 October 1953 to 15 October 1963. He was widely regarded as one of most influential public officials in the government of Chancellor Konrad Adenauer and as the Chancellor's closest confidant during his ten-year tenure as chief of staff. As Chief of Staff he was responsible for the running of the Chancellery, recommending the people who were appointed to roles in the government, coordinating the government's work, for the establishment and oversight of the West German intelligence services and for all matters of national security. He was the German government's main liaison with NATO and other western intelligence services, especially the CIA. He also maintained contact with the party apparatus. He earned a doctorate in law in 1922 and served as a senior legal adviser in the Prussian Ministry of the Interior and later in the Federal Ministry of the Interior from 1929 to 1945. In this capacity he was involved in drafting legislation, including legislation on the confiscation of Jewish property and removal of their political rights. After the war he was officially deemed to have been an opponent of Nazism and fully exonerated of any ties to Nazism in his denazification hearing. In 1949 he joined the German Chancellery as an undersecretary and rose to become chief of staff in 1953. Globke was a devout Catholic and a member of the Catholic Centre Party from 1922 until the party was disbanded in 1933. In the postwar era he became a member of the Centre Party's successor, the Christian Democratic Union. As a powerful éminence grise of the West German government, he had a major role in shaping the course and structure of the state, in West Germany's alignment with the United States, its anti-communist policies at the domestic and international level and in the western intelligence community. He became a central target of the propaganda of the Soviet bloc, both because of his role in western anti-communist policies and his previous role in drafting legislation under the Nazi regime. However, the criticism of him was widely ignored both by the German government and the United States, who saw him as a key anti-communist ally. As he left office together with the Adenauer administration in 1963, Globke was awarded the Grand Cross of the Order of Merit of the Federal Republic of Germany by President Heinrich Lübke. He remained active as an adviser for Adenauer and the CDU during the 1960s. Globke was born in Düsseldorf, Rhine Province, to Josef Globke, and his wife, Sophie (née Erberich), both Roman Catholics and Centre Party-supporters. Shortly after Hans's birth, the family moved to Aachen, where his father opened a draper's shop. When he finished his secondary education at the elite Catholic Kaiser-Karl-Gymnasium in 1916, he was drafted into the army until 1918. After World War I, he studied law and political science at the University of Bonn and the University of Cologne, graduating in 1922 from the University of Giessen with a dissertation on the immunity of the members of the Reichstag and the Landtags. During his studies, he joined, while still in the army, the Katholische Deutsche Studentenverbindung Bavaria Bonn the Bonn chapter of the Cartellverband, the German Catholic Students' Federation. His close contacts with fellow KdStV members and with his membership from 1922 in the Catholic Centre Party played a significant role in his later political life. Globke finished his Assessorexamen in 1924 and briefly served as a judge in the police court of Aachen. He became vice police-chief of Aachen in 1925 and Regierungsassessor in 1926. In December 1929, Globke entered the Higher Civil Service at the Prussian Ministry of the Interior. In November 1932, about two months before right-wing parties made Hitler chancellor, Globke wrote a set of rules to make it harder in Prussia for Germans of Jewish ancestry to change their last names to less recognizably Jewish names, and he followed up with guidelines for its implementation in December 1932. He helped to formulate the Enabling Act of 1933, the law that effectively gave Adolf Hitler dictatorial powers. He was also the author of the law of 10 July 1933 concerning the dissolution of the Prussian State Council and of further legislation that 'co-ordinated' all Prussian parliamentary bodies. He coauthored both the official legal commentary on the new Reich Citizenship Law, one of the Nuremberg Laws introduced at the Nazi Party Congress in September 1935, which revoked the citizenship of German Jews and various legal regulations, such as an ordinance that required Jews with non-Jewish names to take on the additional first names of Israel or Sara, an "improvement" of public records that later facilitated to a great extent the rounding up and deportation of the Jews during the Holocaust. He also served as chief legal advisor in the Office for Jewish Affairs in the Ministry of Interior, the section headed by Adolf Eichmann that implemented the Holocaust bureaucratically. In 1938, Globke was appointed Ministerialrat (Deputy Director) for his "extraordinary efforts in drafting the law for the Protection of the German Blood". On 25 April 1938, Globke was praised by the Reich Interior Minister Dr. Wilhelm Frick as "the most capable and efficient official in my ministry" when it came to drafting anti-Semitic laws. He applied for membership of the Nazi Party for career reasons in 1940, but the application was rejected on 24 October 1940 by Martin Bormann, reportedly because of his former membership in the Centre Party, which represented Roman Catholic voters in Weimar Germany. Globke maintained contacts with figures in the German anti-Nazi resistance, notably Bishop Konrad von Preysing, and according to postwar testimony by Jakob Kaiser, he had been slated for a ministerial position in a government led by Carl Goerdeler if the 20 July plot to assassinate Hitler had succeeded. At the Nuremberg trials, he appeared at the Ministries Trial as a witness for both the prosecution and the defense. Notably, when questioned in the trial of his former superior Wilhelm Stuckart, he confirmed that he knew that "Jews were being put to death en masse." In the postwar era Globke rose to become one of the most powerful people in the German government. In 1949 he was appointed undersecretary at the German Chancellery. He served as Chief of Staff of the German Chancellery from 1953 to 1963. As such he was one of the closest aides to Chancellor Konrad Adenauer. His areas of responsibility and his closeness to the Chancellor arguably made him one of the most powerful members of the government; he was responsible for the running of the Chancellery, recommending the people who were appointed to roles in the government, coordinating the government's work, for the establishment and oversight of the West German intelligence services and for all matters of national security. He was the German government's main liaison with NATO and other western intelligence services, especially the CIA. He also maintained contact with the party apparatus and became "a kind of hidden secretary general" to the CDU, and contact with the Chancellor usually had to go through him. Globke's key position as chief of staff to Adenauer in charge of matters of national security, made both the West German government and CIA officials wary of exposing his past, despite their full knowledge of it. That led, for instance, to the withholding of Adolf Eichmann's alias from the Israeli government and Nazi hunters in the late 1950s and CIA pressure in 1960 on Life magazine to delete references to Globke from its recently obtained Eichmann memoirs. Globke became a central target of propaganda of the Soviet bloc, not so much because of his Nazi era career itself, but because of his powerful position in West Germany and strong anti-communist stance. In 1963 East Germany convicted him in a show trial in absentia; however such East German trials were not recognised outside of the Soviet bloc, least of all in West Germany. The fact that much of the criticism of him emanated from the Soviet bloc, and that it mixed valid concerns with false accusations, made it easier for the West Germans and the Americans to dismiss it as communist propaganda. Globke left office together with the Adenauer administration in 1963. On this occasion he was awarded the Grand Cross of the Order of Merit of the Federal Republic of Germany by President Heinrich Lübke. He remained active as an adviser for Adenauer and the CDU during the 1960s. Wikimedia Commons has media related to Hans Globke. 1 2 Wistrich, Robert (2002). Who's Who in Nazi Germany. Routledge. ISBN 0-415-26038-8. ↑ Bartosz Wieliński (2006). "CIA kryła Eichmanna". Gazeta Wyborcza (in Polish) (8 June 2006). Retrieved 2006-06-08. ↑ Germany, SPIEGEL ONLINE, Hamburg. "A Triumph of Justice: On the Trail of Holocaust Organizer Adolf Eichmann". ↑ Tetens, T.H. The New Germany and the Old Nazis, New York: Random House, 1961 page 39. ↑ Norbert Jacobs (1992). "Der Streit um Dr. Hans Globke in der öffentlichen Meinung der Bundesrepublik Deutschland 1949–1973". ↑ Yen, Hope (6 June 2006). "Papers: CIA knew of Eichmann whereabouts". Associated Press. Retrieved 2006-06-07. ↑ Shane, Scott (6 June 2006). "Documents Shed Light on CIA's Use of Ex-Nazis". The New York Times. Retrieved 2006-06-07. ↑ Weber, Gaby (4 March 2011). "Die Entführungslegende oder: Wie kam Eichmann nach Jerusalem?". Deutschlandradio. Retrieved 2011-03-05. ↑ "Poslanecká sněmovna Parlamentu České republiky, Čtvrtek 24. září 1964" (in Czech). Chamber of Deputies of the Parliament of the Czech Republic. Retrieved 21 September 2013. ↑ Germany. 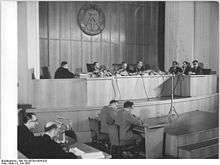 "The Holocaust in the Dock: West Germany's Efforts to Influence the Eichmann Trial". Der Spiegel. ↑ "Reply to a parliamentary question" (pdf) (in German). p. 26. Retrieved 2 October 2012.